Admirers of Turina�s chamber works have had good reason to be grateful to the CD. Whereas before there was a meagre representation we now have a relative abundance; the fine violin sonatas are taking their place on disc, if not on the concert platform, which is where fiddle players should be playing them. But the Trios are also coming into their own. The Russian-born, English-based Bekova Trio has recorded them, as has Trío Arbós. Into the market now comes the American-domiciled Damocles Trio with their myth-sporting moniker to the fore. And thankfully their playing is full of tonal expressivity quite sufficient to reveal Turina�s liquid inspirations. The First Trio of 1926 is a three-movement work of considerable distinction. Violin and cello entwine at the outset with a certain coiled seriousness before the piano refines and simplifies with its own opening statement. As Turina opens out the increasingly effulgent writing one admires the way he builds and relaxes tension, spins succulent melodies � and ends with a pert nostalgic reminiscence of the opening material. Because Franckian cyclical development was very much Turina�s modus operandi, as these works all show, and he was a master of that form. The second movement Theme and Variations on various Spanish dances has ebullience and lyricism in abundance and also a touch of a Gershwin influence (I don�t know how much Gershwin he could have known but just enough even by this early date I suspect). He builds atmosphere with muted strings � helped by this group�s charismatically warm tonal blending. Fluent and optimistic, though lit with moments of impressionist introspection - neatly brushed aside - the finale is full of decorous peals and great excitement. Certainly Turina�s debt to Debussy and to the Parisian school was strong so it�s surprising to hear the sturdy Brahmsian tread of the opening movement of the Second Trio of seven years later. But there�s also a latent sweetness here, French for all the underlying Spanish rhythms. 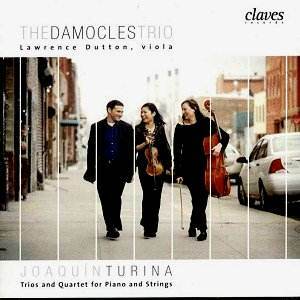 The slow movement of this very concise trio has some scurrying strings over a more placid chordal piano base. Whereas the finale opens portentously, with aspirations to Mussorgskian piano writing and plenty of terpsichorean drive, guitar imitations and fire. It�s the embodiment of Turina�s infectious Iberian drama. The last work he wrote for the piano trio was Círculo. Though he completed it in 1936 it maintains the precepts by which he stood compositionally speaking. Cyclical, impressionist, full of light, lyric grace, though in the second of its two movements the big, bristly pizzicati and declamatory piano add more hints of Gershwin. The finale is colourful, delicate and pastel hued; it�s a work that charts the course of a day and despite the abstraction is a piano trio in all but name. What gives this disc even greater cachet is the inclusion of the Piano Quartet. Couched once more in his favoured three movements and with a tripartite finale this is a work saturated in Andalusian melody � refined, with a plangent role for viola (the excellent Lawrence Dutton). The warm and skirling Vivo second movement sees Zapateado rhythms alternating with more intense moments of impressionism and the finale takes up the theme; plenty of clarity and a triumphant, affirmative end. The performances, as suggested are warm and affectionate; the string players take particular care to harmonise tonal shading and vibrato and pianist Adam Kent never overpowers them. Notes are good, and tri-lingual. The recording matches the performances � not too distant and very warm without blunting rhythm. This is a venturesome disc and strongly welcomed.